Burgess “Burgie” Orth Pennington, son of Clarence and Marie (Orth) Pennington, was born October 23, 1938 in Rock Island, Illinois. 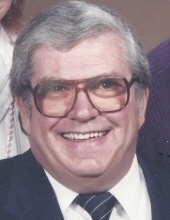 He departed this life Sunday, November 18, 2018 in his home at the age of eighty years and twenty-seven days. On November 10, 1962, Burgie was united in marriage to Kathleen Kotecki and to this union two children were born. They were married for fifty-six wonderful years. He was preceded in death by his parents; two brothers, Beryl and Ronald Orth; and a sister, Jacqueline Deutsch. Burgie is survived by his wife, Kathleen, of the home; a daughter, Christine Wallace and husband Richard, of Overland Park, Kansas; a son, Joel Pennington and wife Thea, of Cambridge, Minnesota; three grandchildren, Ann Marie Rogers, Aaron Rogers, and Danielle Pennington; as well as a host of other relatives and many dear friends. Burgie was raised in the Rock Island, Illinois area and was a graduate of Alleman High School. Shortly after graduation, Burgie moved to Milwaukee, Wisconsin to be closer to family and there he met the love of his life, Kathleen Kotecki. Following their marriage, they moved back to the Quad Cities and he started his career in the car sales industry. He worked for over forty years as an award-winning salesman for various Ford, Lincoln, and Mercury dealers. After Burgie and Kathleen retired, they made their home at the Lake of The Ozarks where they enjoyed spending time with their friends and lake family. Burgie was baptized into the Catholic Church as a child and was a member of St. Anthony Catholic Church in Camdenton. In his spare time, Burgie enjoyed spending time with his friends at the Moose Lodge and was an avid gun enthusiast. He had a passion for music and had passed that same passion on to his children. A visitation will be held from 1:00 pm until 2:30 pm Friday, November 23, 2018 in the Allee-Holman-Howe Funeral Home with Funeral Mass at 2:30. Memorial donations may be made to St. Jude’s Children’s Hospital in care of the funeral home at 15 Clint Ave., Camdenton, Missouri 65020. To send flowers or a remembrance gift to the family of Burgess Orth Pennington, please visit our Tribute Store. "Email Address" would like to share the life celebration of Burgess Orth Pennington. Click on the "link" to go to share a favorite memory or leave a condolence message for the family.